'Bambella: Don't just dream in your sleep. Don't just dream in your sleep. This is a simple outfit I wore recently to uni. I find I overdress quite often for uni, so sometimes I feel like I need to have a few chill out days with no heals and no fur. It was pretty chilly this day so choosing this shirt was a wise move. It's so thick and warm, and just perfect for this time of year. I also wore my Superdry gilet with this, but chose not to photograph it as it's quite chunky and is hard to actually see anything else when it's on! 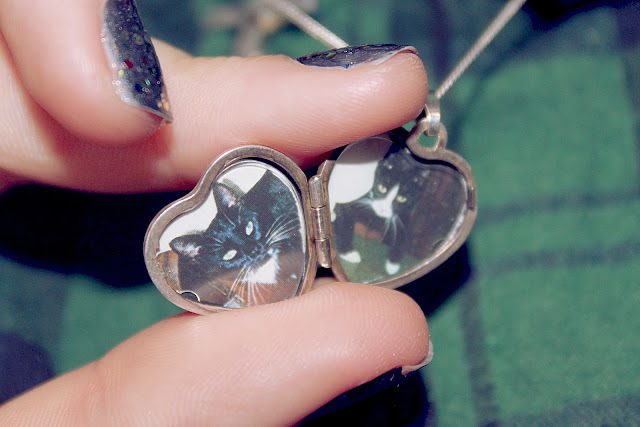 For those of you who are nosy like me and would like to see what's in the locket. My babies, Jojo and Charlie. I love the colour of that shirt! oh and glad you found your phone again lovely! Aww. So sweet you have your kitties in there! Adorable. I love your outfit ! It suits you well.